I have been chomping at the bit to get this sauce recipe on the interweb. A) Because it’s my new favorite sauce EVER. And B) Because I know you guys are going to LOVE it. This is just one girl’s humble opinion, but I’m quite sure that sun-dried tomatoes are one of the absolute best flavors in existence. The tangy, savory flavor is like someone took the essence of summer and made it into a concentrate. Tastebud party! 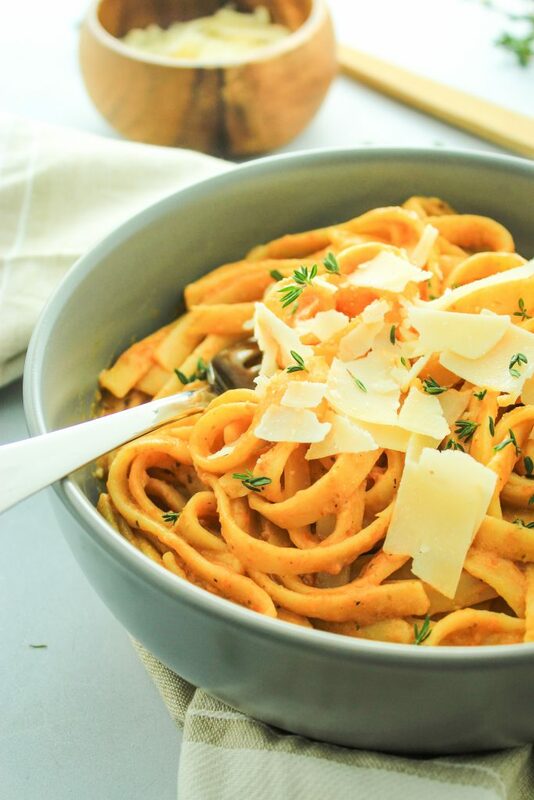 This alfredo sauce is me paying tribute to those magical tomato flavor bombs and turning them into something you can use to drown pasta (or drink straight from the blender, whatever – it’s your prerogative and I’m not here to judge). Step 1 – You throw everything in the blender. Blend until smooth. Step 2 – Heat it up and eat it. Got it? Good. It’s seriously that easy. We’re not fussing with melting butter or making a roux or mixing in cheese. Although, I have no beef with that super-decadent style of homemade alfredo. I just think there is plenty of room in our pasta-loving world for this simple kind of alfredo sauce. Especially when it involves sun-dried tomatoes. The only “out of the ordinary” ingredients you will need are nutritional yeast and whole coconut milk. We buy nutritional yeast in bulk because we use A LOT of it. And we buy our coconut milk at Costco, also in bulk because we use a lot of it. If you’re wondering what in the heck nutritional yeast is, here’s the lowdown. vegetable broth, optional, to thin sauce to desired consistency. Combine all ingredients into a blender and blend on high speed until well combined. Scrape down the sides to be sure all of the chunks are blended. Heat and serve over pasta, veggies, veggie noodles, etc. Garnish with fresh herb of your choice. This recipe makes 16 oz. of sauce. Depending on the pasta or veggies you pair it with, it serves between 4 and 6 people. Store in the refrigerator for 7-10 days. Nutritional yeast is NOT optional for this recipe. The only substitution would be regular parmesan cheese. Was not a fan! The coconut milk was a bad choice for a dish like this. Flavour wise it clashed too much with the sundried tomatoes and just didn’t go. I have made creamy vegan sauces before and have found that soy milk works best. None the less, I thought I would give it a go as I love the sound of a vegan, creamy, sun-dried tomato pasta sauce! Will make it again but with soy milk, and can thicken with any kind of flour if need be. I’m sorry that you didn’t love this recipe! Personally, I’m a huge fan of coconut milk. I love using it for all sorts of sauces and dishes. I hope you used the type that comes in the can, not from the carton. That certainly makes a huge difference. I’ve made this recipe a couple of times now and love it! 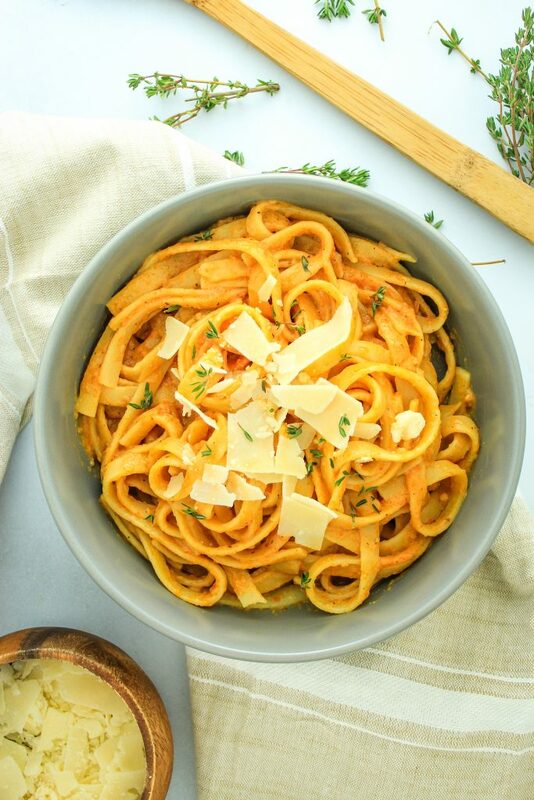 What a brilliant idea to use coconut milk (canned – it’s creamier than the refrigerated drink type) for pasta sauce! It blends so well with the Italian seasoning and sundried tomato flavors. 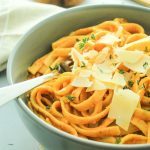 Such a creamy, rich pasta sauce without the dairy! This is on regular rotation at our house now. I found we didn’t need the veggie broth as the sauce was already quite thin – but perfect consistency to coat each piece of pasta. Awesome! I’m so glad you enjoy this recipe! I love using coconut milk for pasta sauces. :) No dairy for the win! Yum! I wanted sun-dried tomatoes and I wanted quick. This is a delicious sauce! Just tried it. EXCELLENT!!! We tweaked it and added generous amounts of cayenne pepper and Cajun seasoning over penne pasta. We also added the remaining sun dried tomatoes into the pasta. 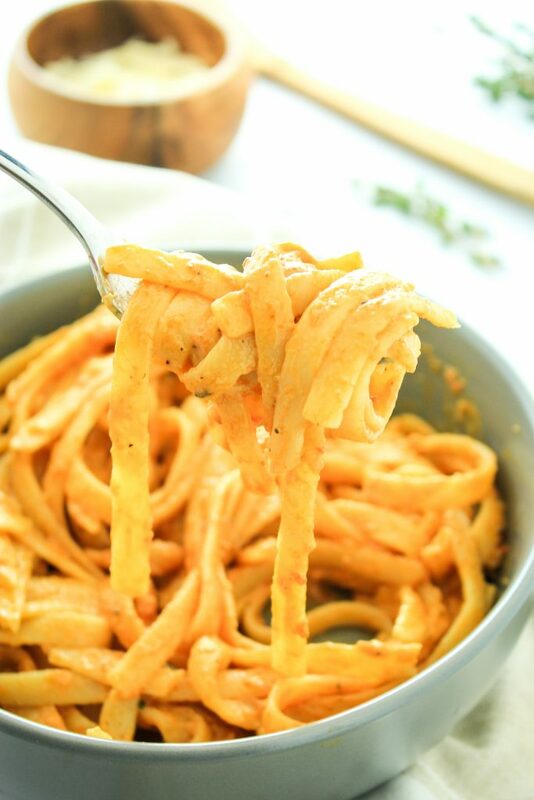 Vegan cheesy Cajun pasta that even our anti-vegan kids gobbled up. Thanks!! Exactly what I was craving! This is the bomb. The flavor is rich, tangy and cheesy. I poured some over shiratake noodles. This will become a staple for me. Thank you for sharing! Hey what is that cheese you sprinkled on top at the end???? Just a bit of shaved parmesan! Totally optional. Do you drain the oil from the tomatoes? Yes, just add the tomatoes. None of the oil from them is necessary. I’ll clarify that in the recipe! Made this for dinner last night, was very delicious! Can I use something else in place of the white wine vinegar? Of course! You could use lemon juice for acidity or just add more broth. Hi. Could I use something other than coconut milk? Hi Gali – You could substitute almond milk, cashew milk, or even regular dairy milk if not vegan. You could certainly try rice milk! I would recommend adding more nutritional yeast to thicken. Would this still taste nice without the nutritional yeast? Hi there! The nutritional yeast is important in this recipe because it thickens the sauce and provides a “cheesy” flavor. If you’re not vegan, you could certainly use parmesan cheese instead. Otherwise, I’d definitely recommend keeping the nutritional yeast!